THQ: "Fiscal Year 08 Was A Very Tough Year"
Despite reporting modest revenue growth for its 13th consecutive year, THQ reported a net loss of $35.3 million for the fiscal year ending March 2008. The company's sales totaled $1030.5 million, relatively little change from last year's $1,026.9 sales. THQ president and CEO Brian Farrell said that most of its struggles were due to a crowded and competitive market for kids' games, as well as key franchises — Juiced, Stuntman and Conan that ultimately "were simply not competitive." "Insufficient game quality led to inadequate sellthrough, resulting in markdowns at retail," Farrell said. Farrell said the company spent heavily to promote Juiced and Stuntman, and had to take a loss when those titles fail to perform. What growth THQ did see, Farrell credited to Frontlines: Fuel of War, MX vs. ATV Untamed and WWE SmackDown vs. Raw 2008, all of which exceeded expectations. Farrell also said the kids' market, in which THQ has several franchises, was the most competitive in years, and that the company's currently struggling to compete with music games and Nintendo first-party titles. 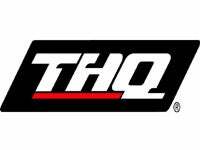 Nonetheless, THQ appears to have placed its faith in the Wii, concentrating much of its upcoming original IP there. Although Saints Row 2 and Red Faction Guerrilla are still the "anchors" of its lineup, Darksiders, De Blob, Deadly Creatures, Big Beach Sports and All Star Cheer look likely to be slated for Wii along with other unannounced projects, though the company did not announce specific platforms. New installments in existing franchises for fiscal 2009 include WWE SmackDown vs. Raw 2009, Disney/Pixar's Wall-E film tie-in, and its previously-revealed Nickelodeon portfolio. The company will publish a game based on DreamWorks' Animation's unannounced 2010 fall film, and has slated WWE: Legends of Wrestlemania for 2009. Notably, the company seems to have an eye on the free-to-play, microtransactions-driven online gaming market in Asia, highlighting the co-publishing agreement it's signed with Shanda Interactive to bring Company of Heroes Online to China in 2009. THQ is more confident about the year to come, with three new initiatives in place: "We are rolling out a stronger slate of products. We have put in place and are executing against initiatives to improve our product quality and competitiveness. We are also realigning our cost structure to generate significant operating leverage in fiscal 2009. We believe these initiatives will restore profitable growth and improve value for shareholders," said Farrell. "We faced a number of challenges, but I believe we have the right strategy to overcome these challenges and achieve significant growth."